First I have to apologize for this late publishing of this GW-post. Second this GW-post is written by Jen of Blog It Or Lose It. In this GW-post Jen tells us something about Edgar Allan Poe. So have fun! Today my son mentioned that his English teacher had “taught” his class about Edgar Allan Poe. Oh, how exciting, I thought! With (perhaps eerily) gleaming eyes I asked my kiddo to tell me more. What did he think about Poe? 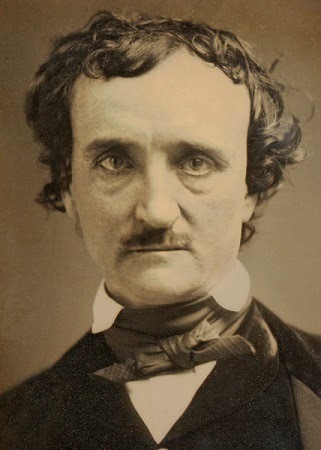 The class learned that Poe is thought to have invented modern detective fiction. They learned that Poe wrote “The Raven”. They learned that he died of mysterious circumstances, and everyone thought it was pretty creepy that he married his much-younger cousin. I was shocked, horrified, and dismayed. Did he at least hear about The Pit and the Pendulum? The Cask of Amontillado? The Tell-Tale Heart? Surely his teacher mentioned The Masque of the Red Death? Well, that won’t do. Not in this house. We will be exploring Edgar Allan Poe (in small doses). He’s probably best known for having written “The Raven”. 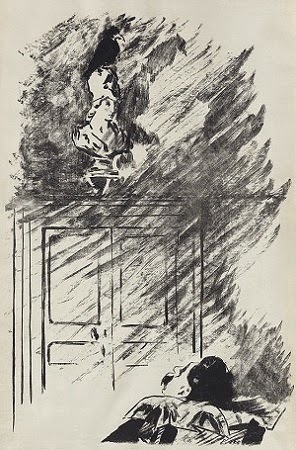 But – while reading Poe this evening, I discovered “A Dream within a Dream”. So – for this Ghost Writer prompt – I ask “what does this poem say to you”? Do you choose to stand on the surf-tormented shore? Do you see winged things flying into the distance – lost? Can you interpret “a dream within a dream” in terms of nature? When you read “A Dream within a Dream”, where did the muses lead you? I hope you did like this post and I hope it will inspire you to write haiku. Thank you Jen for providing us with this GW-post. This episode is NOW OPEN for your submissions and will remain open until November 7th at noon. I will (try to) post our next episode, Large Pink, another one of the Seven Sacred Autumn Flowers, later on. Oh, what a pleasant surprise to see you were able to use this GW prompt - and so soon too! Perhaps your muse was emitting long-distance brainwaves to my muse last evening! The kiddo learned a little more "about" Poe today -- but not enough for his liking -- he came home and asked if I'd buy him a book on Poe. Pretty cool! Sorry for the lateness of my response! gGreat chatty but deep post and coments. I found it tough though! Tough in writing the haibunish piece. Tough memory too. Now must pull myself back up. Sorry for the late response, Hamish -- your haibun was magnificent -- painful, but magnificent. 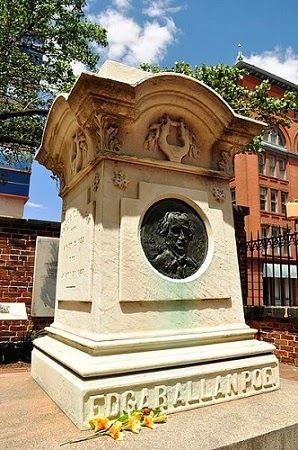 I was just at Poe's home in Baltimore. Once it was on the outskirts now it is in the older section that has had seen so much poverty.It was hard to imagine four people living in a house the size of a postage stamp. I guess people would have sleeping schedules. He was and is an enigma for as much as you try to understand the man you don't. I had a discussion regarding what if he had lived. What if he had lived and his enemies (which he seemed to collect) discredited his name? Thanks Jen for the prompt I do hope that your kiddo learns about this man who inspired many. Poe certainly collected enemies, that's for sure. But even in death his enemies were discrediting his name. Especially in death, actually, with the rumors that he'd died an alcoholic, was mentally ill (looked upon much differently then), etc. I kind of wonder - if he'd lived and managed to salvage his good reputation - would he be as loved today? Seems to many of the "reputable" poets from that time have faded into obscurity.